Hunting down the perfect man can be pretty much akin to the quest for the Holy Grail, or perhaps being on the hunt for a unicorn, or looking out for a pot of gold at the end of a rainbow. All of those do not exist, and yes, there is no such thing as a Fountain of Youth, either. However, you can start with some “base materials” in your man to groom him into being the person who you have always wanted him to be. Alternatively, there is the $7.99 The Perfect Man – which lives up to his reputation since he is not alive in the first place. 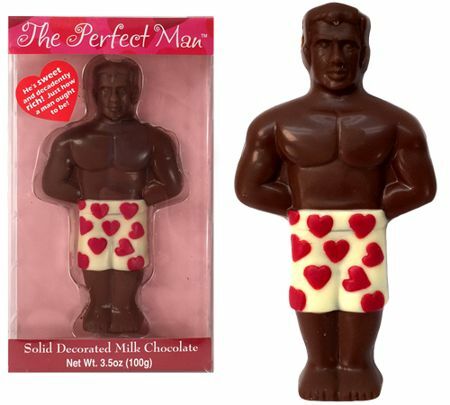 Made out of the perfect hunk of chocolate, he is tall, dark and handsome. And delicious. Not only that, he is decadently rich, and does not talk back. Makes for a great prank Valentine’s Day gift.